More than half of U.S. kids pick strawberries as their favorite fruit. No wonder. The fruit is pretty to our eyes, sweet to our taste, and juicy in our mouths. Wild strawberries grow on every continent except Africa and Australia/New Zealand. But you wouldn't want to eat some of them. Often, they are really small and tasteless. Some aren't even red. So how did the strawberries you buy at the store or from roadside stands get to be SOOOOO delicious? The great-great-great-great grandparents of today's strawberry come from two different continents—North America and South America. And they accidentally met and started producing a new type of strawberry on a third continent—Europe. This happened about 250 years ago, probably in a botanical garden in France. In the 1500s, explorers brought one of the grandparents back to France from Virginia. This Virginia genotype got their attention because it had larger fruit and a deeper red color than the European strawberries of that time. And it produced more berries. But it had to wait nearly 200 years for the other grandparent to arrive from South America. In the early 1700s, a French spy spotted this strawberry genotype in Chile while he was making maps of Spanish forts. Plants of this genotype produced really big berries—larger than the spy had ever seen—so he brought a bunch of them back to France. Trouble is, they didn't reproduce in France. Not until scientists called horticulturists (hor-ti-CUL-chur-ists) planted them next to the Virginia genotype. BINGO, they started producing baby plants. You see, all the plants from Chile were female and needed pollen from other strawberry plants to produce fertile seeds. It wasn't long before a new strawberry was born. The horticulturists named it Fragaria x ananassa. The baby berry was such a success that its great-great-great-great grandchildren are grown around the world today, mostly in the northern hemisphere. 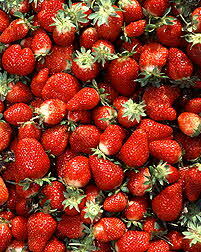 The United States is the leading producer and supplies about 20 percent of the world's strawberries. Next are Spain, Japan, Poland, Italy, the Korean Republic and China. Every U.S. state grows strawberries that have been specially bred for that region of the country. California grows about three-fourths of U.S. strawberries. Florida is the next largest producer. All the different varieties grown in all the different countries can trace their ancestry back to the marriage of the Virginia and Chile strawberry in Europe 250 years ago. Strawberries today are susceptible to a lot of diseases, and growers would like them to be more resistant. They would also like their plants to bear fruit earlier in the season and to make other improvements. The only way to do this is to change the plants' genes. Six scientists from the federal government, universities and a commercial strawberry grower are holding strawberry tryouts around the country. Each of the scientists is growing 20 to 40 of the best of the Virginia and Chile genotypes, looking for traits they want the most. "We will pick the most outstanding genotypes of those two parent species for breeding," says Stan C. Hokanson. He is a geneticist with the Agricultural Research Service (ARS). In Dr. Hokanson's plots in Beltsville, Maryland, one genotype flowered nearly 2 weeks early. And two genotypes were disease free in the fall, "when all the cultivars were covered with leaf spot, scorch, and powdery mildew," says Hokanson. He is one of two ARS scientists working on the evaluation project. Jim Hancock, professor of horticulture at Michigan State University in East Lansing, oversees the project. He says researchers had already selected promising genotypes during earlier evaluations. "We tried to pick the best from these and select a representative sample. It's like doing the final cut." A whole new strawberry with unique flavors and textures could result from these tryouts. But it will take at least 12 years— more likely 15 to 20 years—before strawberries with new, desirable traits go to market, says Tom Sjulin, with the large California grower, Driscoll Strawberry Associates, Inc.
By Judy McBride, Information Staff, Agricultural Research Service.